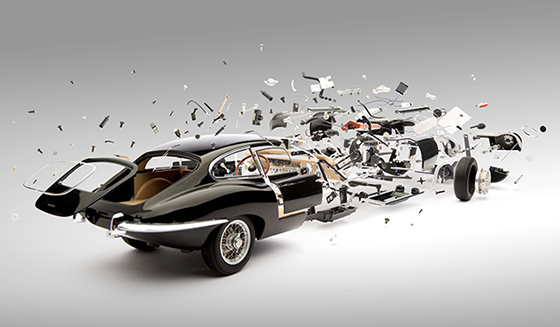 Swiss photographer Fabian Oefner's Disintegrating is a series of composite photographs that seeks to invent moments in time. 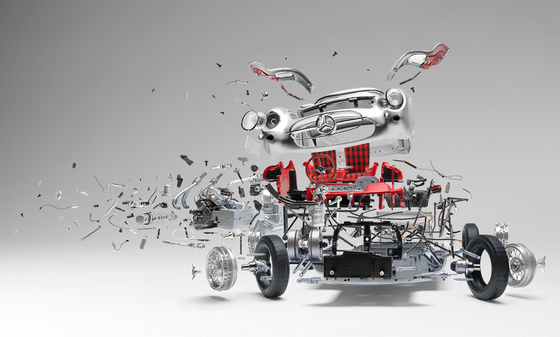 Each photograph depicts a car "disintegrating" into its composite parts, and took hours of work to create. 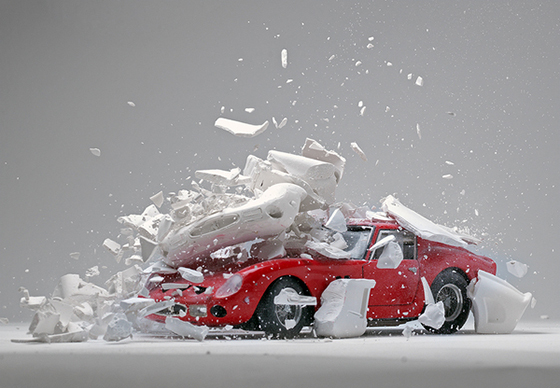 Rather than using CGI, Oefner took detailed scale models of a number of cars and photographed them piece by piece, before using Photoshop to piece them together. The attention to detail in each shot is staggering. Each component has to be photographed from exactly the right angle in order to maintain the illusion before being precisely positioned. "What you see in these images," Oefner says, "is a moment that never existed in real life ... there is a unique pleasure about artificially building a moment. Freezing a moment in time is stupefying." Oefner's comments were published by the Mechanical Art Devices gallery in Geneva, Switzerland, which is currently exhibiting the photographer's work. In addition to Disintegrating, Oefner also worked on a similar series, Hatch, in recent years. Hatch involves none of the complex Photoshop masking of Disintegrating; instead, Oefner crafted white shells from a model car by first making a latex mould and then filling it with gypsum. After manufacturing dozens of shells, Oefner set about destroying them. The following shot, of one of the shells being dropped onto the original model, creates the illusion that the car is "hatching" out of its shell.